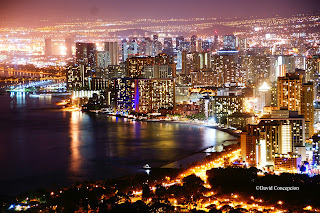 Hawai`i began here. 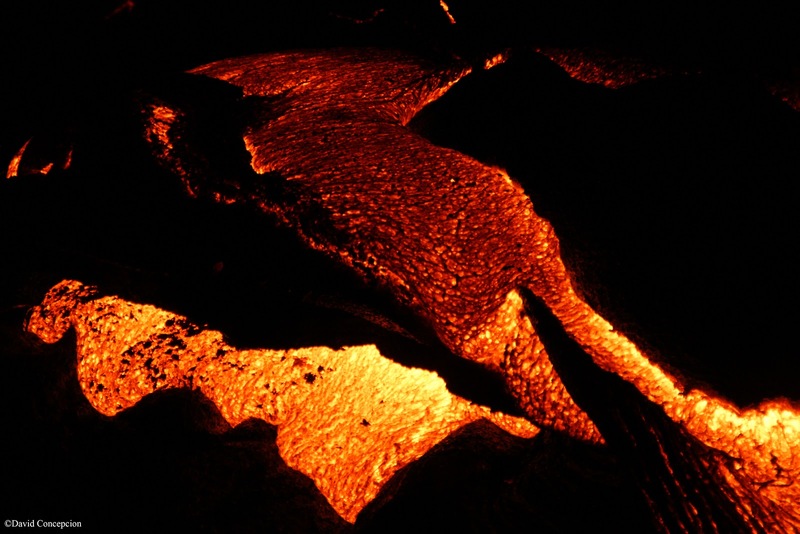 Thousands of miles below the Earth's crust, a big pool of magma formed the Hawaiian archipelago in the vast ocean of the Pacific. Usually volcanoes are situated on the edge of tectonic plates. 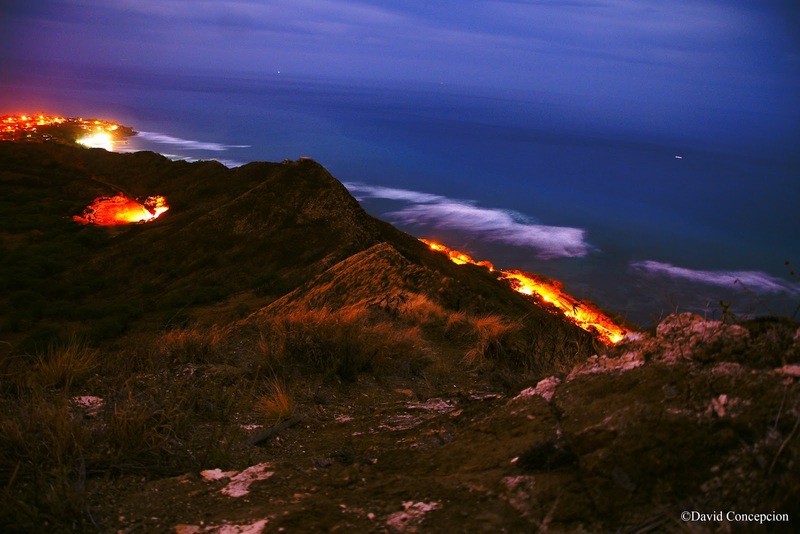 The rim of the Pacific Plate has become known as the "Ring of Fire" as it is dotted with numerous volcanoes and are prone to major earthquakes. 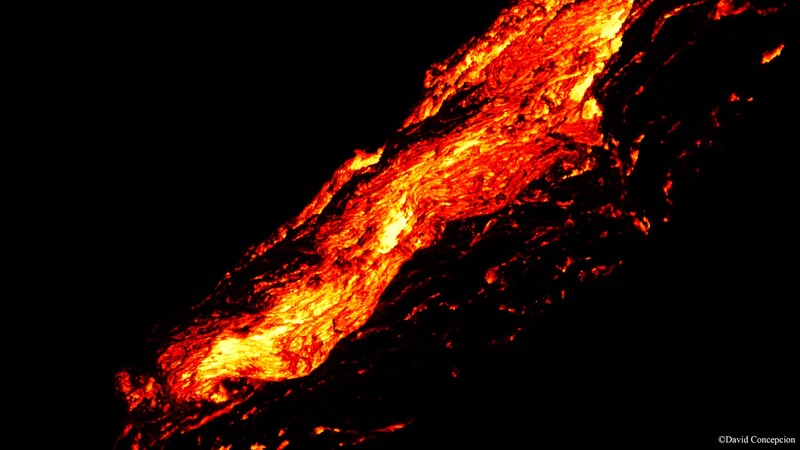 But out in the middle of the Pacific Plate lies what is called a volcanic hotspot. The accepted theory is that this hotspot remains stationary while the plate moves about on top of it. As it does, island after island form over millions of years which forms a chain of islands. 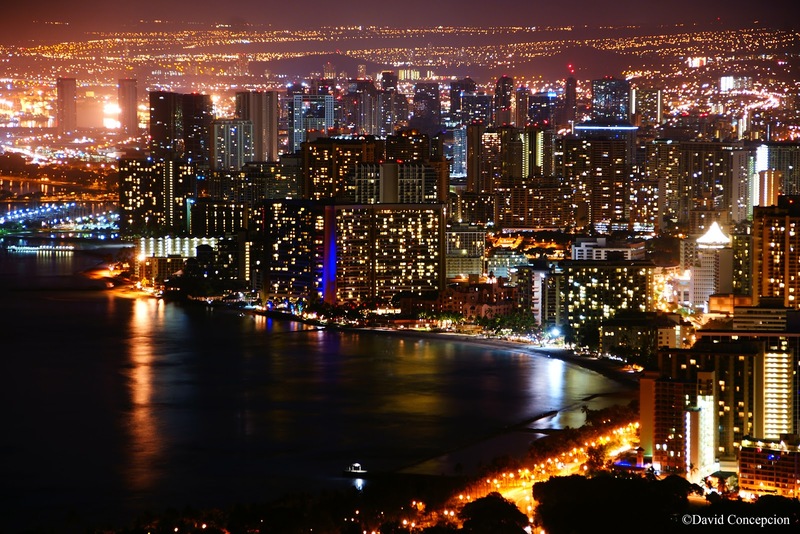 The Hawaiian islands were formed in this way and continue to do so. 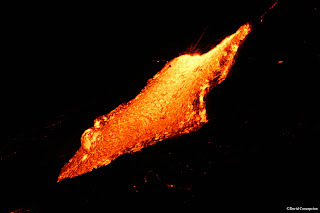 At present, the hot spot is under Kilauea Volcano, situated on the southeast portion of the Big Island (Hawai`i Island). It continues to erupt and I had the privilege to stand on land that was only minutes old! The Hawaiians call her Madame Pele, the volcano goddess. 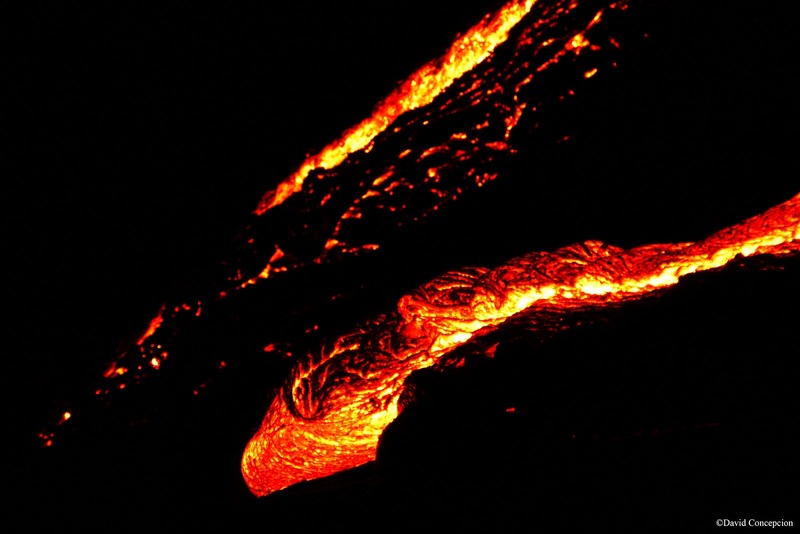 She rules Kilauea and anyone who dare opposes her will be met with a fiery ending. I hoped I would be on her good side when the time to visit her was upon me. 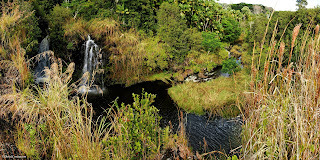 I finally got the honor and privilege to hike with TJaye Ailama Forsythe of rustyboar.com and a good brother of mine who lives in Hilo. 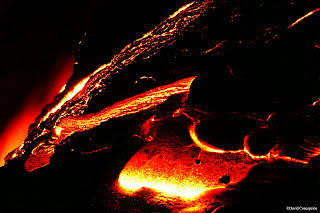 He has told me about the lava flows that are actively flowing. 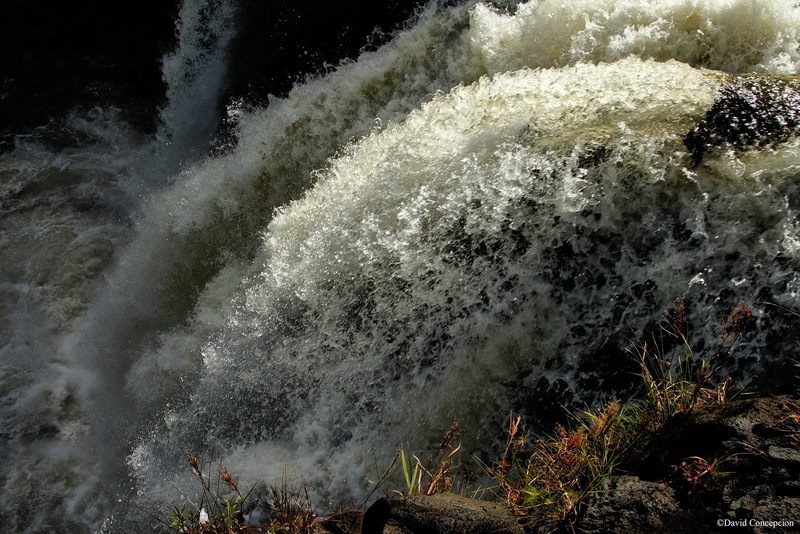 These flows experience upsurges in activity from time to time. Since I've never experienced lava up close and personal, I have since waited for that day to come. It finally did, on the fall of 2012. 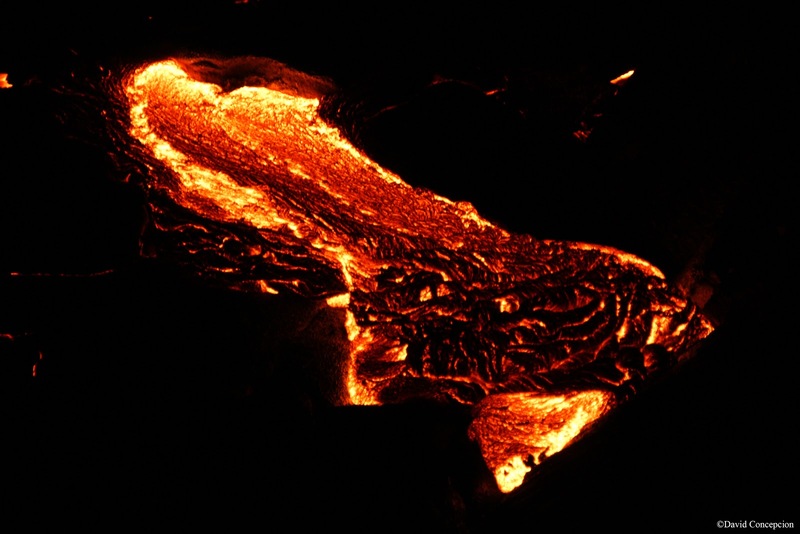 Puʻu ʻŌʻō, located on the eastern rift zone of Kilauea Volcano, was showing high activity in November and the early part of December. It was time to make it happen, but it couldn't have been done without help from Bruddah TJaye and Christopher Wong, who also lives in Hilo. 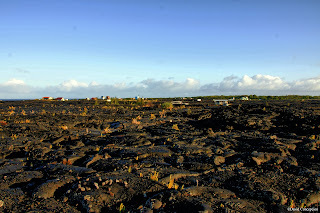 Ailama went to Kalapana to visit the lava flows there a week prior to my scheduled visit. 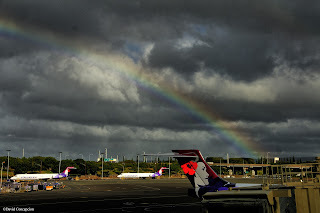 It was his trek that gave me the inspiration to get my okole off my own stomping grounds of O`ahu and board a flight to Big Island. Chenay Borja happened to be free that day and agreed to journey with me since it was going to be her first time visiting an active lava flow. 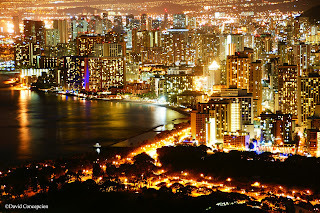 The plan: stay in Big Island for half a day, overnight, and return back to O`ahu at 6am the following day. With Hawaiian Airlines tickets in hand, we were going to make it happen! On Sunday (12-16-12), I got up and drove over to Punchbowl to pick up Chenay. 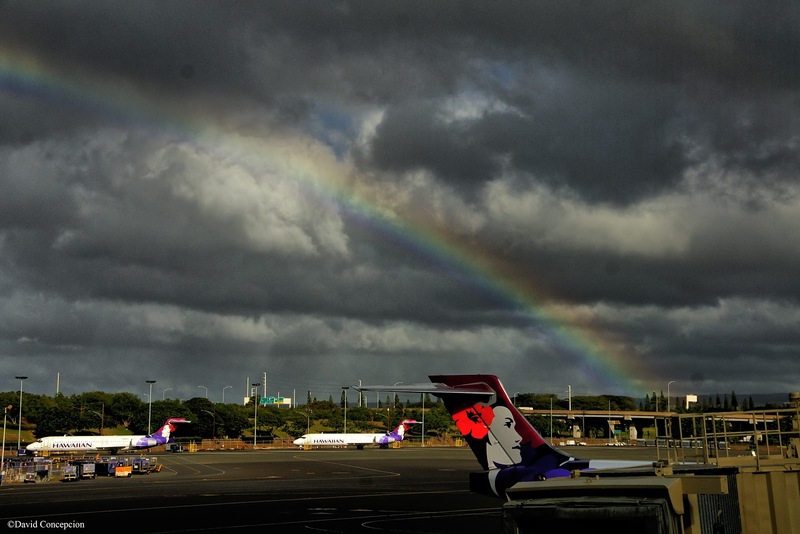 Once at the gate at Honolulu International Airport, we waited anxiously for our flight. Suddenly, a brilliant rainbow appeared in the background. It was a sign. We arrived at 12:23pm at Hilo Airport and Chris picked us up. After getting a bite to eat, we realized we still had some time to kill. Since we were to go just before sunset, Chris showed us a waterfall that is visible just off the side of Waianuenue Ave. A 10 minute walk through a well trodden trail that parallels the Wailuku River permitted us to reach the top of the upper tier (lower one is some kind of man made falls). Several mini lookouts on the left of the trail gives a view of the river but don't get too curious, lest you find yourself in the Wailuku River! 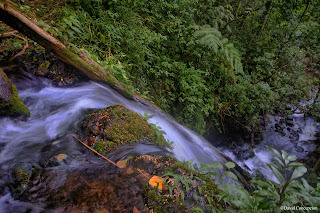 About a quarter mile in, we reached the top of Wai`ale Falls. And boy was she pumping! I was surprised because of the major drought that we've been experiencing for most of the fall season. 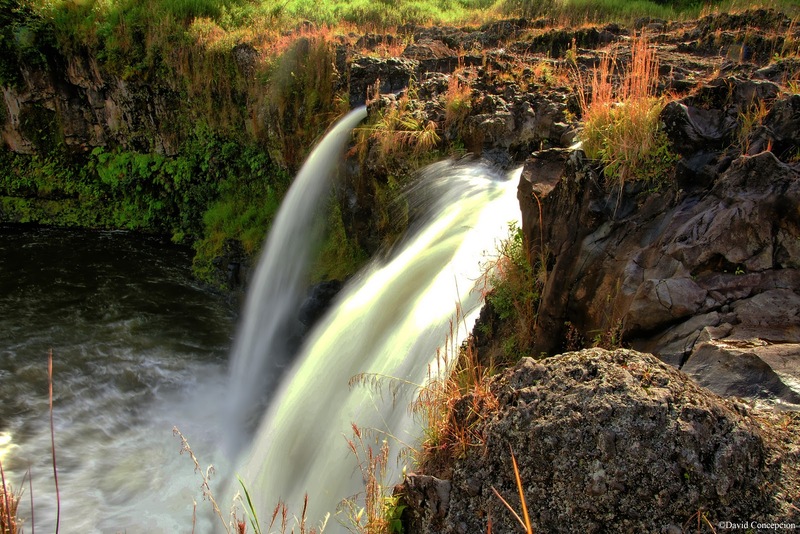 And Big Island's famed "Rainbow Falls" has completely dried up on Dec 3! I wasn't sure if Hilo received enough rain to have that fall flowing again but Wai`ale Falls was raging! Wai`ale wasn't the sole waterfall in the area. 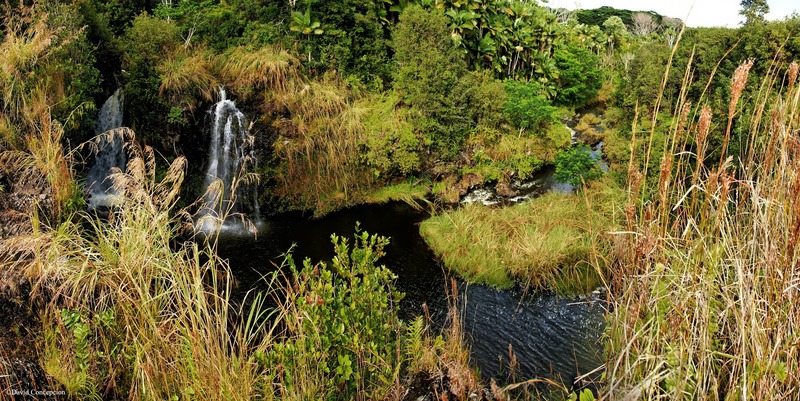 In the vicinity are three more smaller waterfalls that made for a tranquil scene! It was around 3pm when we went to Chris' house to prepare for the journey to Kalapana. Three other friends were to join us at 4pm. 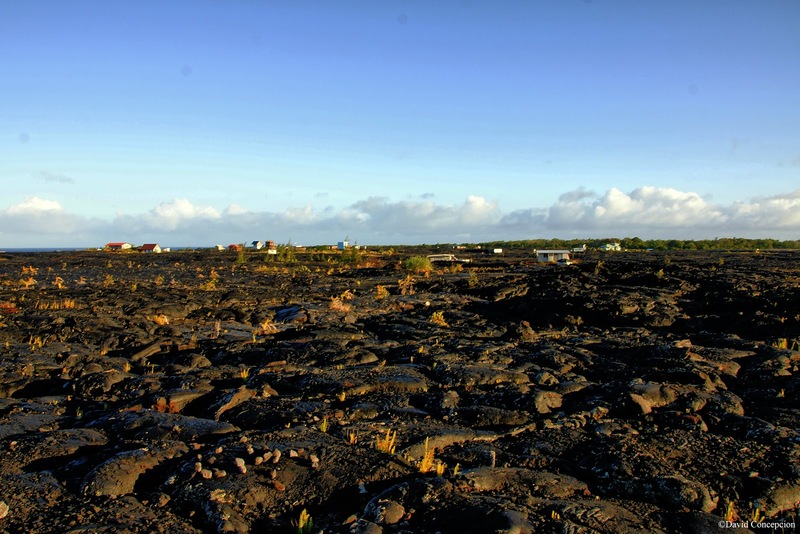 Once we reached the Kalapana area, we were met with Civil Defense guards where the old road terminates with the old lava flows. Apparently a lookout exists at the very end and is a known tourist area. Advancing further was not possible as the guards' presence forbid doing so. In an effort to bypass this viewing area, we attempted to head towards the coastline but was stopped by another civil defense guard who apparently parked his car in this area. This guy was rather bitter about us being here and gave us a good scolding. ::sigh:: blah blah, private property... This guy needed some aloha injected into him. I'm guessing he must have encountered many people attempting to reach the active lava flow in the past so I wasn't surprised that he was this aggressive with us. Disappointed, we made our way back to the cars. We needed to regroup. Back at Chris' house in Hilo, we pondered plans about attempting to try for a second time but at 11pm. The civil guards' duty shifts are from 4pm to 10pm each day, which makes for an odd shift. In fact during our scolding, the guard even told us that if we truly wanted to illegally see the lava flow, that it's best to come in the morning when they were not there! Apparently they know that many people sneak in while they are not there. 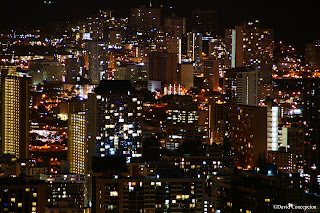 Under normal circumstances, we were to return that night at 11pm, but because our flights were in the morning, this was not possible. The time was now 6pm. I had to take drastic action otherwise, this trip would be in vain. I called up Bruddah TJaye and told him about what happened. He agreed to take us there, not at 11pm, but right now. We had a renewed sense of hope! 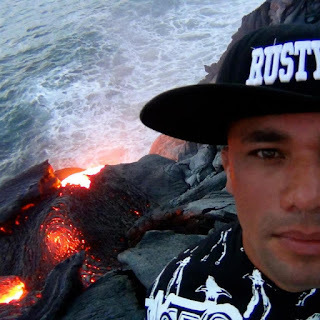 Being pure Hawaiian, he has a Kingdom ID card that allows him to be able to go into land areas that are normally restricted to the general public. 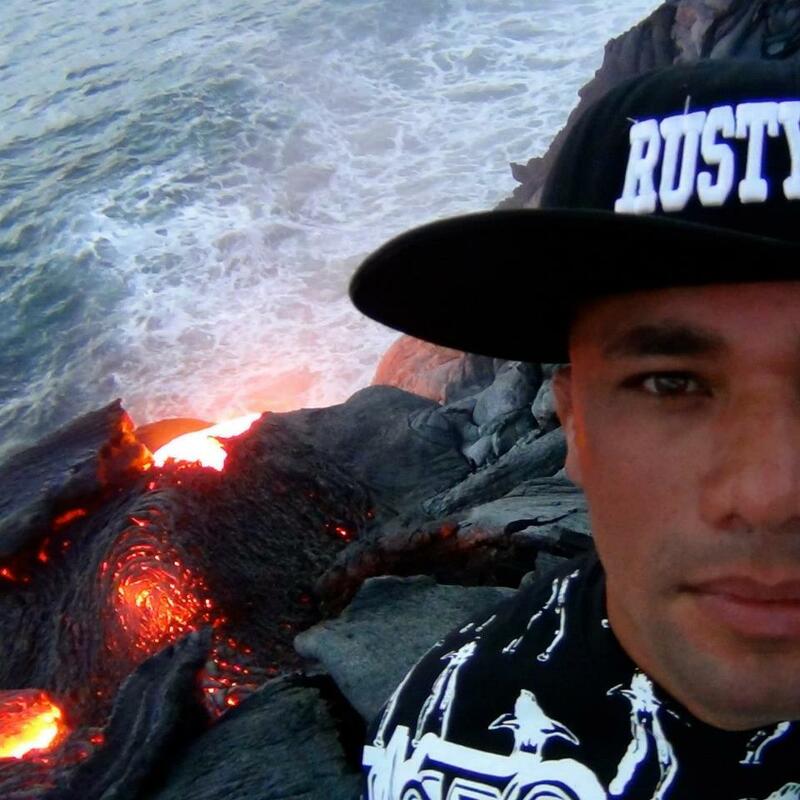 Being Hawaiian, he can "claim sovereignty" and declare that he has "gathering rights" to be in these sacred lands. The door was now wide open. We were back at around 7:30pm, but the same guard we've encountered area was not there. 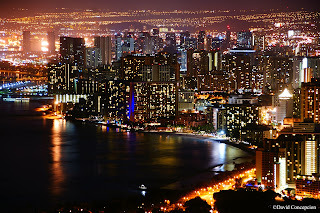 Upon reaching the lookout area, the guard present once again stated that it was off limits to advance further. TJaye immediately brushed her statement aside and presented his Kingdom ID card to her. She still persisted in saying that we couldn't go but we merely jumped over the rope marking the viewing area. She threatened to call the cops and have our vehicle towed. 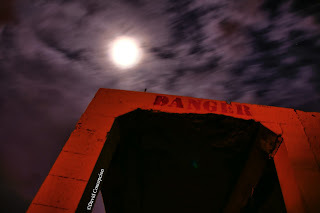 We merely shrugged it off and disappeared into the night as she radioed, probably to another Civil Defense guard, that there were five individuals trespassing. They knew there was nothing they could do at that point and it was all bark and no bite from there on out. Even then, they couldn't make good on their threat. Unbeknownst to them, our vehicle was legally secured on Hawaiian property and was not possible the Civil Defense to reach it. 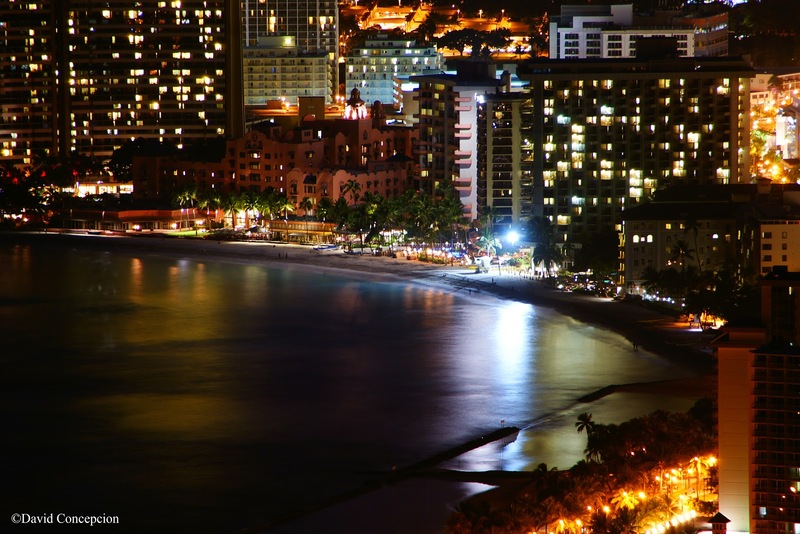 Hawaiians - 1. Civil defense - 0. We were all smiles after that! For Bruddah TJaye and Bruddah Chris, it was another hike. For Chenay and I, we were exploring the final frontier of our home islands. 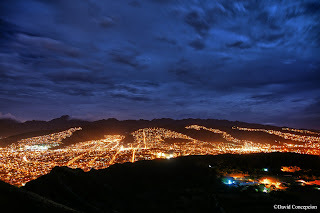 As the lights from the Civil Defense area dimmed further and further behind us, I felt a sense of calmness. Like being the only ship in the middle of space, we hiked onward towards the black horizon. 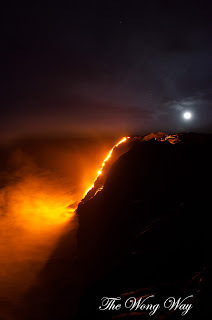 Since we were aiming to reach the ocean entry of the lava flow, our route took us towards the jagged pali coastline. Looking up I saw the sky like I've never seen it before. I spot a brilliant meteor streaking across the sky over in the direction of the Kilauea caldera. 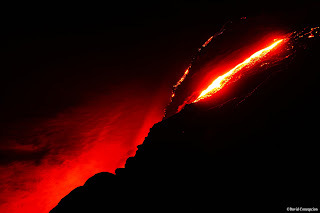 Further up on that flank, I spotted red glowing lava flows, probably some 6 miles away. Off in the distance was the quarter moon, still rather bright. One thing I've noticed was the terrain. We were walking on decades old lava flows. While the area is flat, the terrain we were walking on is very uneven. We had to navigate around large cracks that consisted of old lava tubes. We merely stepped over smaller crevices. Pāhoehoe lava has a distinct rope-like appearance and numerous of them lined together form ripples in the terrain. Hiking over these can be tricky. The best way is to walk broadside with these ripples, otherwise you risk tweaking your ankle. I noticed on the smooth glassy areas, the ground was hallow! 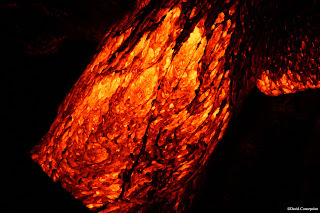 Perhaps large lava tubes were underneath and the scary thought of me crashing down through the ground filled my head. But the ground held. Some caved in a few inches, like walking on ice, but overall the ground was rather solid. We stopped and glanced towards the black horizon in the direction of the ocean. I barely made out a red glowing point. Then another red point appeared next to it. That was our target lava flow. Like moths attracted to the light, we quickened our pace and made our way towards the red light. The glowing points soon became bigger and bigger and by the time we knew it, we were looking face to face with Madame Pele's lava. 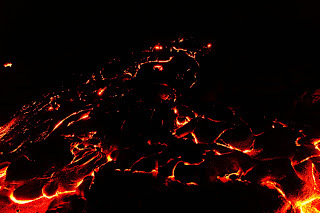 We were probably 500ft from actually reaching the red hot lava when suddenly heat began radiating from under the pitch black ground below our feet. At this point, we cautiously made our way towards the active surface flow. At around 300ft, we spotted the cracks below us were no longer black, but glowing red hot! 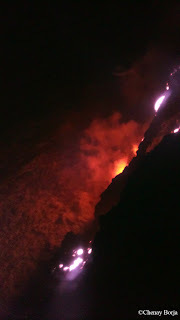 We were standing on top of a lava tube that was flowing with red molten rock! We had to be careful now because the worst thing that could happen is the black solid ground would cave in, sending you plunging into the red abyss below! Fortunately, that never happened and the ground in fact held very well. We were now 50ft from the surface flow and things really started heating up. I could feel my hiking shoes heating my feet! The final 10ft was painful, but TJaye managed to walk up to the flow and kick it with his foot! 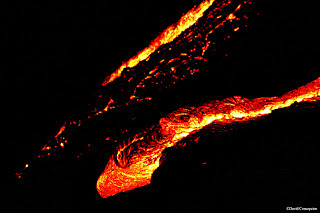 I saw that plume of lava wiggle like it was jello! He told me to do the same. I kicked it and while it was still glowing red hot, it was rock solid upon contact! The lava was cooling enough to solidify into rock but remained glowing. I was stoked! It was at that point that our attention shifted to the actual coastline, about another 500ft or so ahead of us. 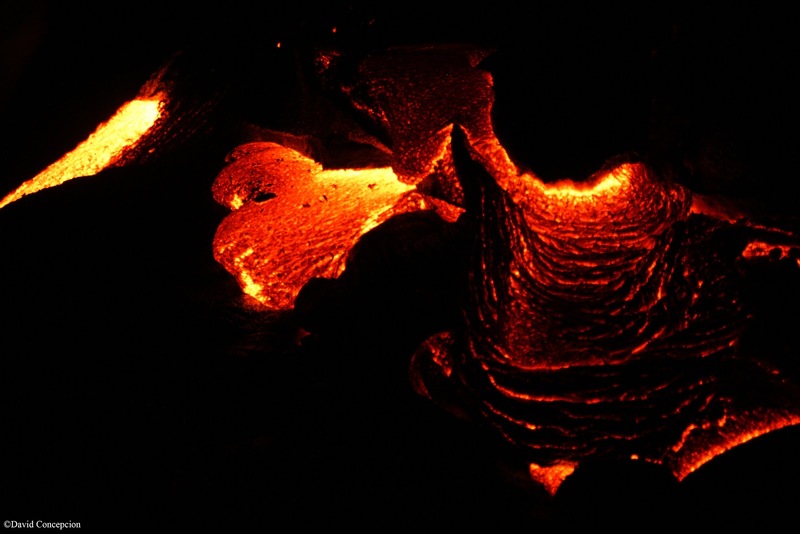 Paralleling the surface lava flow, we made our way towards the pali that drops straight down into the ocean and there it was. Red hot lava was oozing down the steep pali and exploding on contact with the ocean waves. I could hear the loud hissing and at times small explosions as steam was rising up. 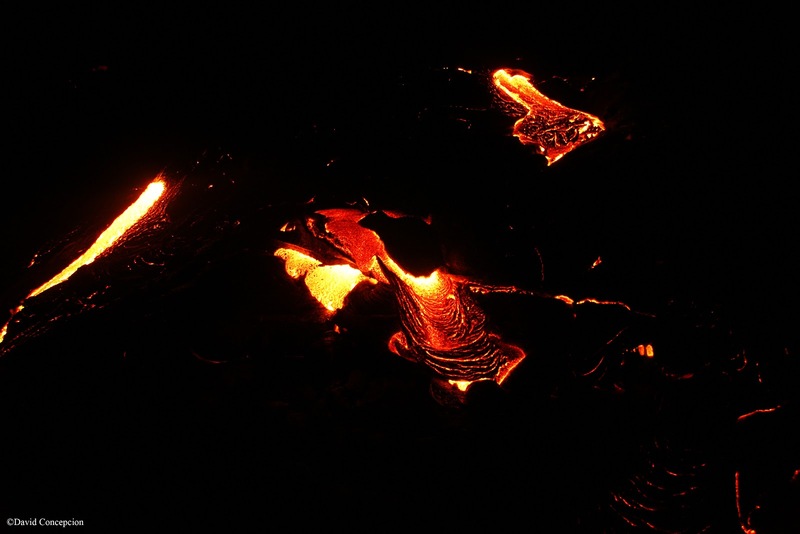 At times, large chunks of glowing rock would break off the side of the pali and land into the ocean! It felt like I was on another planet! 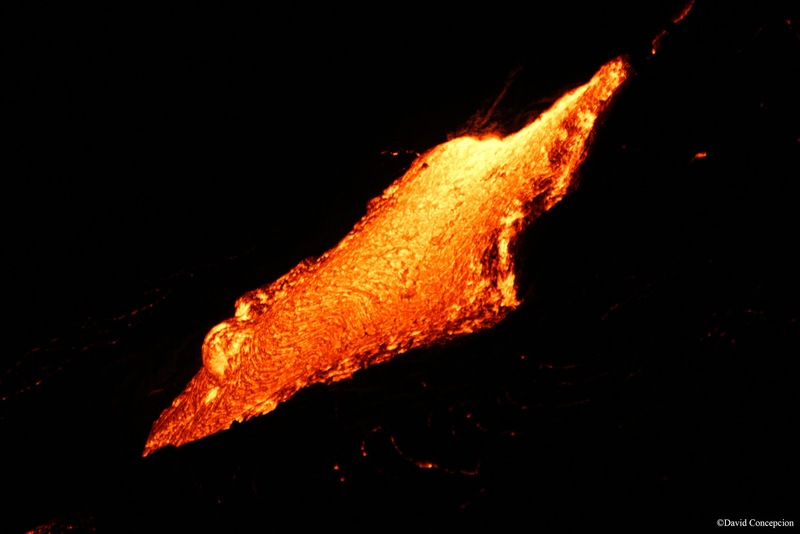 Finally, I can say I've seen a real active lava flow with my own two eyes. We spent probably some 2 or 3 hours taking in the awe that we were watching land being created right before us. 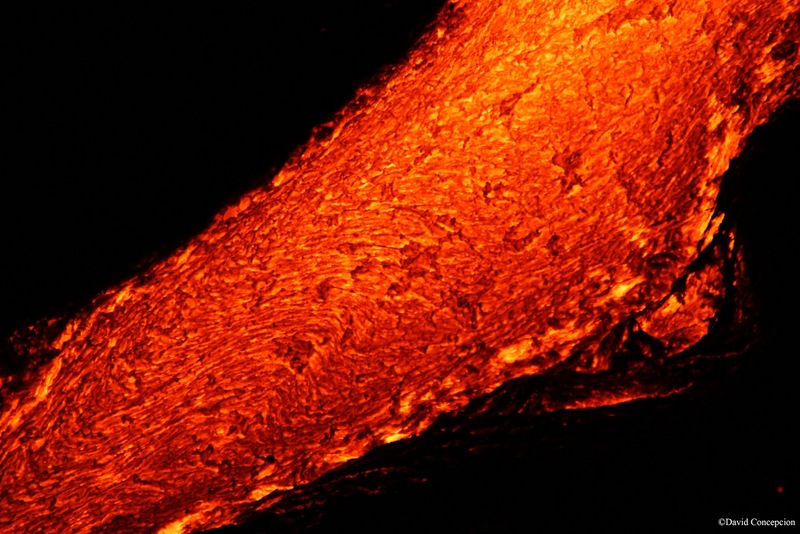 All the Hawaiian islands started with this hot red orange gooey stuff. When the first finger of flowing lava ceased and it's glowing became dark, another fresh finger would appear out from the darkness and flow down into the ocean. And then another. In fact we had to pull back because these fingers were opening up a little too close to us. 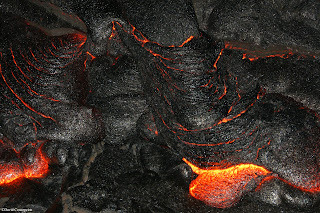 I posed for some camera shots by standing on freshly cooled lava, being able to tolerate the heat for not even 5 seconds, just enough to get that shot! I've never felt heat in such a large scale before. The pain felt good! One thing I noticed was my intake of water. I would highly recommend bringing extra water because the heat will dehydrate you more, requiring you to consume more water than normal. Unfortunately, all good times had to come to an end as our time had run out. Flights were to soar the skies in about 8 hours from now and we still had to hike another hour back to where we started. Heading back was no easier than going. We relied on GPS coordinates to guide us back to our starting point. As we hiked back, I was still processing the raw information in my head of my experience during the last 3 hours. 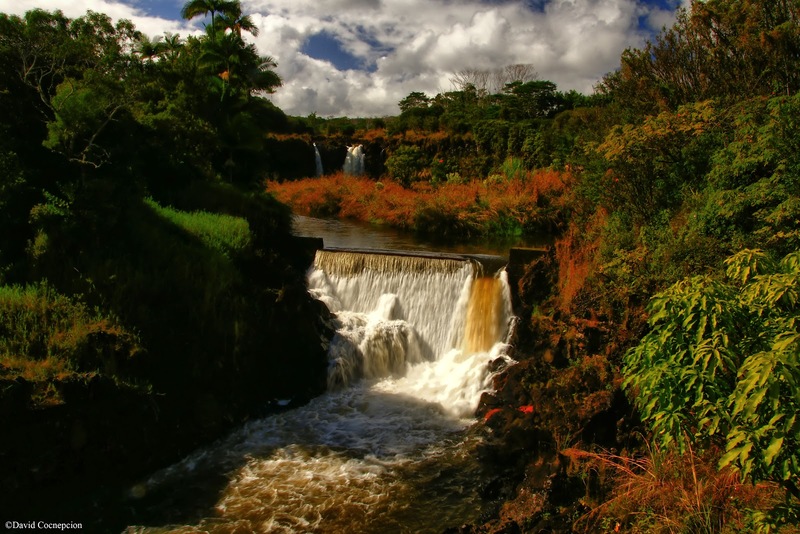 We reached our vehicle and drove back to Hilo with a sense of accomplishment. Back at Chris' place, Chenay and I couldn't sleep, all we could do was look at all the photos we've taken. 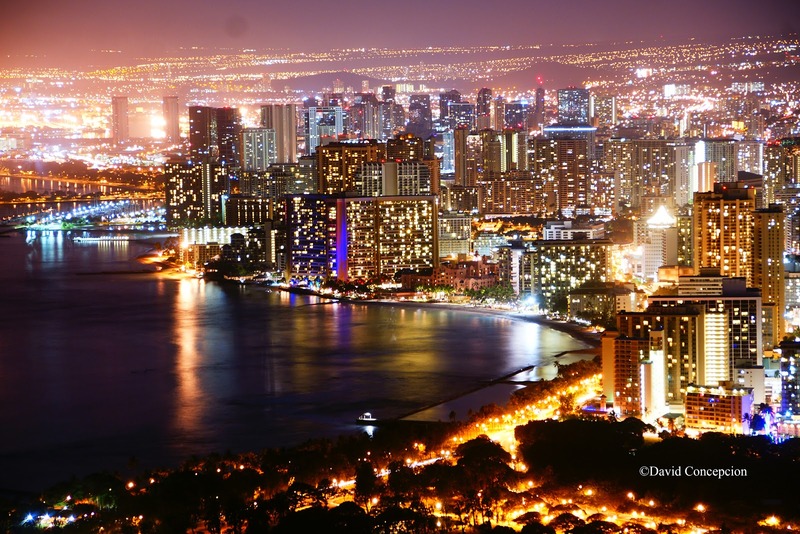 Once back on O`ahu, we couldn't help but realize how small we are compared to nature, that all of these islands that are now heavily dominated with civilization began as red hot magma! I'd like to express my gratitude to Chris for providing us transportation and accommodations during our short stay and to TJaye for driving us to Kalapana and taking us to the lava flow. If it wasn't for these two individuals, none of this would have been possible. Mahalo nui loa to both of you for making this happen. This will be a night to remember indeed! Cheee hooo! 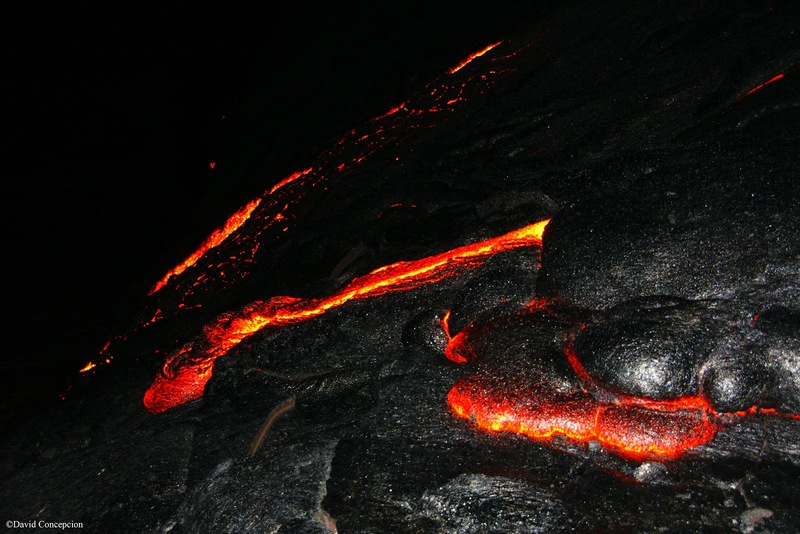 CAUTION: While lava can be visitor friendly (Hawaiian lava flows exceptionally slow / flow with aloha), they can be unpredictable and dangerous. There is no trail leading to the active flow. You are walking on a vast plain of old lava flows with no visible reference points. This can lead to people getting lost so I highly recommend bringing a GPS device with you. The terrain is very uneven so make sure your ankles are well supported and look out for large cracks. The last thing you need is a tweaked ankle in the middle of a lava field. As you near the flow, you'll notice the temperature spike while being even a quarter mile away from the surface flow. 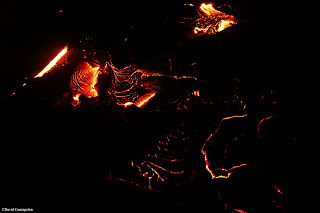 If you see glowing lava in the cracks below, you are on active lava tubes. Take care where you step. If the rocks crack, move away immediately. If heading to the ocean entry, be wary of the sulfur dioxide and the sulfuric acid as the water reacts with the lava. Try not to get on the very edge of the pali, they are very unstable. 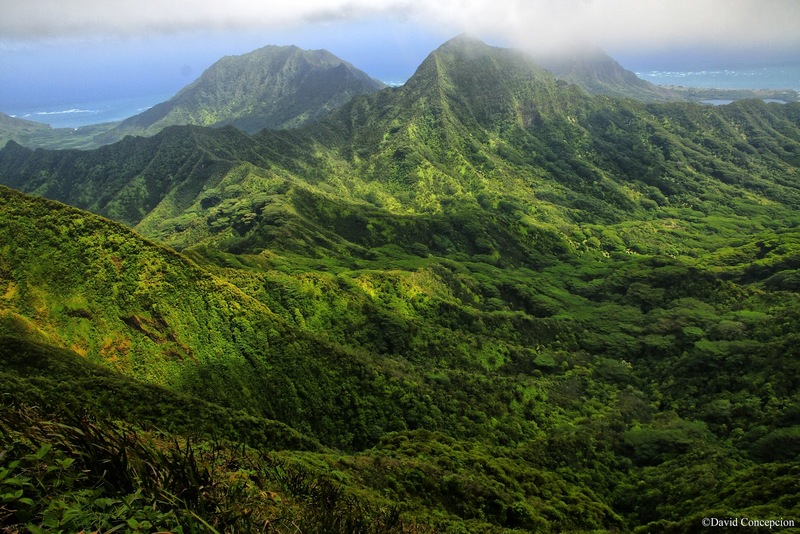 They can collapse and send the unwary hiker down the pali into the scalding ocean. Last but not least, Civil Defense guards patrol the entry point from the road and will turn you away if you try to cross the barriers or head into private property... unless you are native Hawaiian and possess a Hawaiian Kingdom ID card! We've hit the trails around the Diamond Head Crater Rim for a third time and I've personally took the best photos this time around, mainly because I finally got the focus correct. 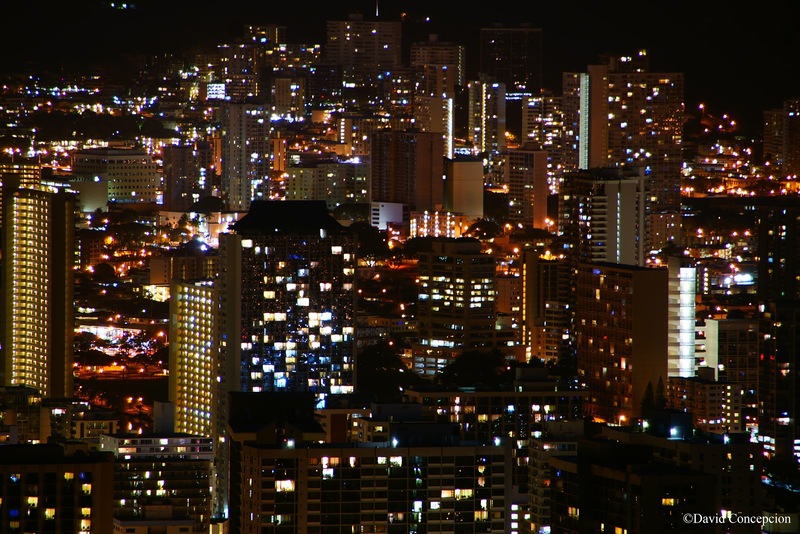 When it comes to night photography, manual focusing can be pretty frustrating. When you think you got it focused and it looks great on that little tiny LCD screen, it looks terrible on the computer screen, but I finally got it exactly how I wanted it. I ended up taking a good friend of mine, Rick Kamakea who was visiting O`ahu for the weekend. I've documented this route 2 other times (here and here) so a write up won't be necessary. However, I will mention that there was one thing that was different from the last two hikes. While all three hikes started from the same starting location, there was some sort of device mounted on the warning sign at the cul-de-sac that was emitting a blinking red light this time. Upon closer inspection, we realized it was an infrared camera, or so it seems. There are cheap dummy infrared cameras that can be bought anywhere online so it's a good possibility that DLNR or someone installed a fake camera to deter hikers from going up on this location. I'm not sure about the other entry points. Enjoy the photos! 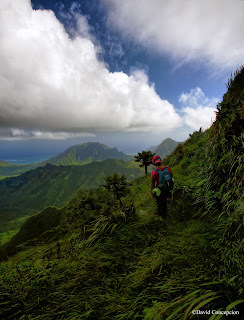 The last time I did the Waikane trail was in 2009 and it was one of my most miserable hikes I've done. 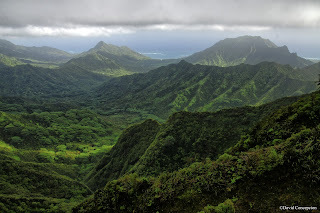 The weather was so unforgiving with torrential rain and gale force winds that I didn't even make it to Pu'u Ka`aumakua, the official trail terminus. 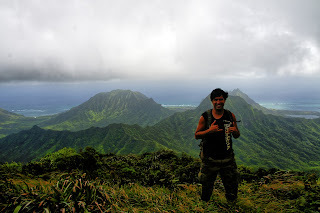 It would be be nearly 3 years later before I would make my return, but this time I was to go to the summit and beyond to Waiahole Uka, the Ko`olau windward partner of it's leeward counterpart, Kipapa Trail. My last Ko`olau summit hike was Manana to Waiahole Uka. 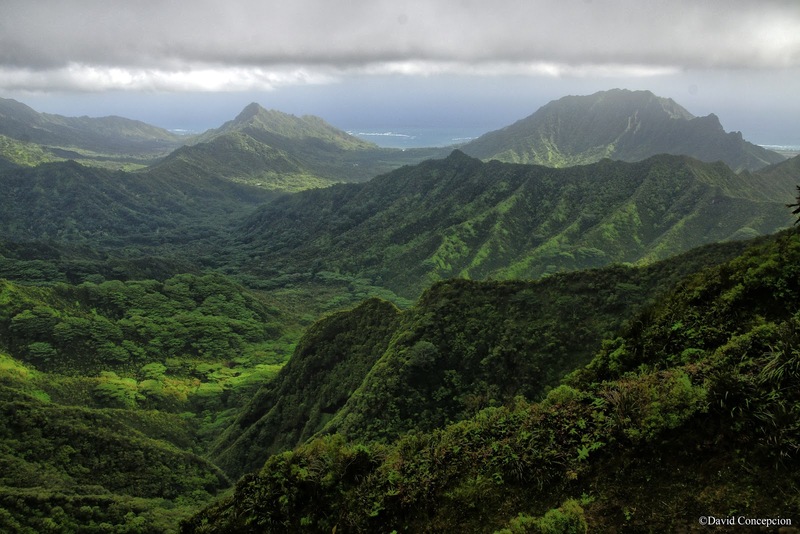 This hike would mark my very first trek on the graded Ko`olau Summit Trail, a trail built into the rolling hills of the northern Ko`olau mountains between Pupukea and Kipapa. Joining me on this day would be Thessa and Gerwin. We pushed off from the main highway at around 6am and began a long road walk to the start of Waikane Trail. About a mile in we began to hear the sounds of dogs barking. 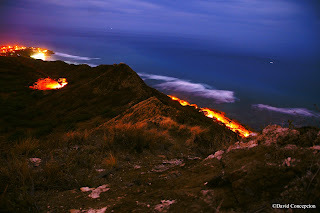 Around the bend, our headlamps pierced the darkness and revealed a pair of glowing eyes. Much to our dismay a group of dogs were blocking the road. We stood for sometime, wondering if they will be friendly to us or finding ourselves running back to the road as they would attempt to maul us to death. Soon, a black dog would decide it was going to be the bravest of the pack and approach us, wondering if we too were friendly or not. The dog approached us cautiously and then soon sniffed us. With it's tail wagging happily, first contact was established and "hostilities" ceased. After being playful with the black dog, it returned back to the rest of the pack and we began advancing slowly towards them. Finally they backed off and we were on our way. 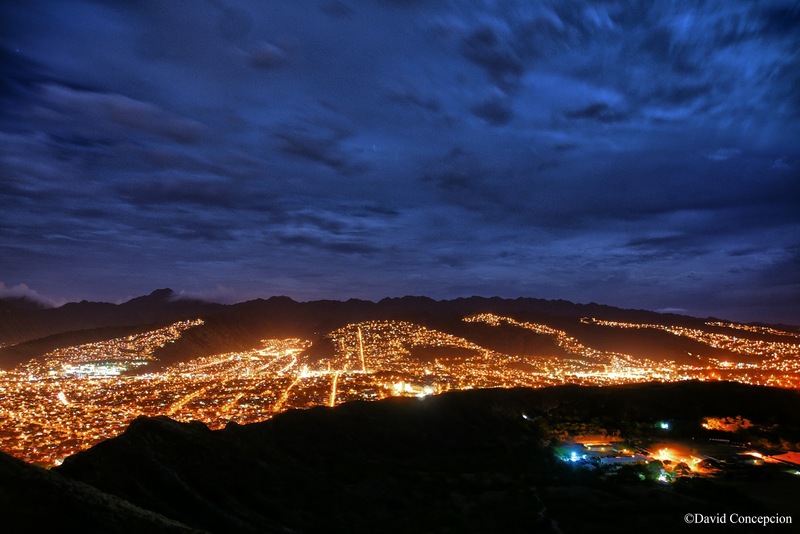 The first signs of daylight was now visible. When the road was finally visible, we came across a huge landslide that apparently covered the road. But we saw tire tracks and assumed that the big trucks just simply drove over the landslide to pick up the road on the other side. Some further up, we crossed a small stream and arrived to the start of the trail, marked by an old storm drain. Wasting no time, we made our way up the rather dull graded trail. We talked stories along the way and the trail kept on winding around the gullies and side ridges. Eventually the trail made a very sharp left but not before coming upon a wonderful lookout at Kahana Valley to the northeast. About another 30 minutes to an hour later, the views of the windward Ko`olaus were upon us and we can in fact, see the remainder of the trail, etching into the windward pali just below the crest. Since this was the actual KST, the summit trail contours below the crest, rather than on it's top. Another hour or so passed and we came across a junction, marked by an old metal stake with ribbons on it. Turn left almost 180 degrees to pick up a switchback to head up to Pu'u Ka`aumakua. Continue straight and you're automatically on the KST heading towards Poamoho, which features the best stretch of summit walking because it almost exclusively contours the windward side! This junction is crucial if you are coming in from Poamoho. If it's socked in and you're not paying attention, it is incredibly easy to assume that you're still on the KST, but end up taking the wrong way at the junction and unknowingly continue down on the Waikane Trail! 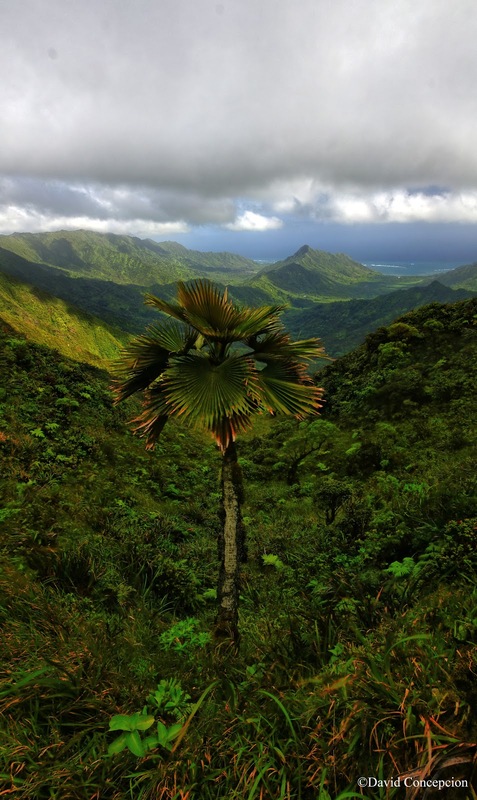 The trail to Ka`aumakua from the junction is also part of the KST, but it's also the last leg of the Waikane Trail to reach the true summit. Here, the trail begins to contour on the leeward side of the Ko`olau crest and spells doom for those hikers not wearing pants. It is very overgrown and your legs will take a battering if you're not properly dressed! Even with the recent "clearing" compared to decades ago, the overgrowth is relentless. 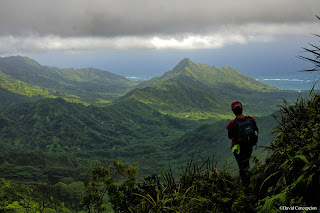 After crossing a clearing with a splendid view of northern windward O`ahu, we came across a grassy gully with a side trail heading up to the top of a pu'u. Turns out this side trail is the final climb to reach Ka`aumakua, which is indicated with a geological bench mark. At last, the Waikane Trail had been completed. We proceeded to have lunch here. The time was probably around 10am. The views were incredible initially, but the clouds quickly rolled in, obscuring it. The trade winds were in full force and we had to go just slightly leeward to feel reasonably comfortable. We packed up and made our way back down to resume the grueling jaunt along the KST, heading southward. For much of the way, leeward contouring is what is all about. 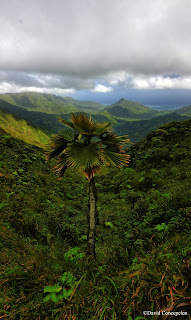 There were a few grassy clearings where a view of the windward side can be had, but it's very spotty. 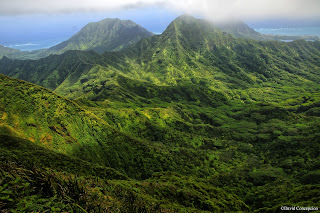 Leeward, leeward, leeward, overgrown, overgrown, overgrown was the topic of the hour. 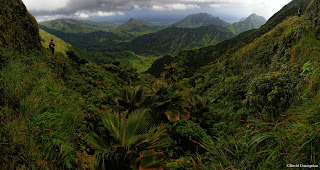 But the views of Ohulehule, Kahana, and Waikane when we did have a windward walk were well worth it! Later on, the clouds were beginning to thicken and our hike became a walk in foggyland. There were times that when we would round a spur ridge, we would think it was the wrong way because it appeared to head back the way we came from. With no windward view for a reference point, our minds were being fooled. Fortunately GPS on our smartphones confirmed the way was correct. I highly recommend having some kind of navigational device with you. You can seriously think you're lost and second guess yourself, leading you into a bad situation. We soon came across a very large grassy gully that is dubbed the "wind tunnel". It is no joke. The winds felt like hurricane force winds and literally knocked us off balance. We had to bend forward and push against the howling wind. But don't fret. Once you get to the other side of the grassy gully, the winds quickly cease as the trail heads back to it's leewardness. On the next bend or two, I noticed a familiar hill off in the distance and pointed it out that it could be Waiahole Uka. Once we rounded this hill, I immediately noticed the Sugipine trees that we've encountered when we did the hike from Manana. We were here at last! We quickly beelined it up the hill to gain the summit. And by the time we did, the clouds gracefully lifted off and we had views all around us! I looked back along the summit crest and saw the hill with the huge landslide etched into it, marking the Kipapa terminus. After taking in the views, we headed downwards. We headed very downwards. I purposely used bad grammar on that last sentence because that's all it does: go downwards. It's very hard on the knees and toes as we had to battle gravity to do a controlled descent. 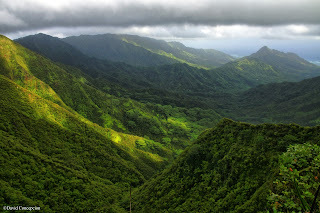 The two rope sections were passed and it became a sea of uluhe all the way down to the valley trail. Once on the valley trail, we made our way out back to our car that we staged earlier in the morning. Finally I can put Waiahole Uka to rest for good.